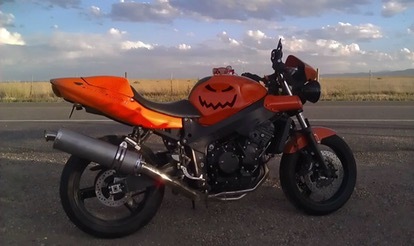 Jack o’ Lantern Trumpkin: evil eyes and toothy grin adorn this orange Speed Four. A Moto for the macabre. 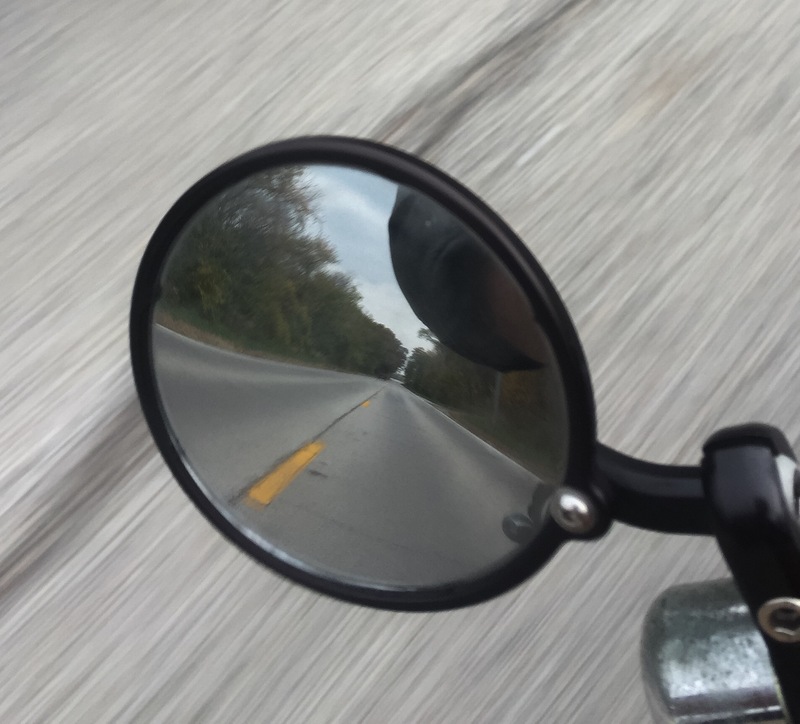 Objects in Mirrors- as the past recedes to a point of perspective; the current moment blurs by. The future? Well the road ahead is filled with only a hint of what awaits. If you keep a good hold of the bars, not too firm mind, lean into the corners, the trip is assured to be a good one. 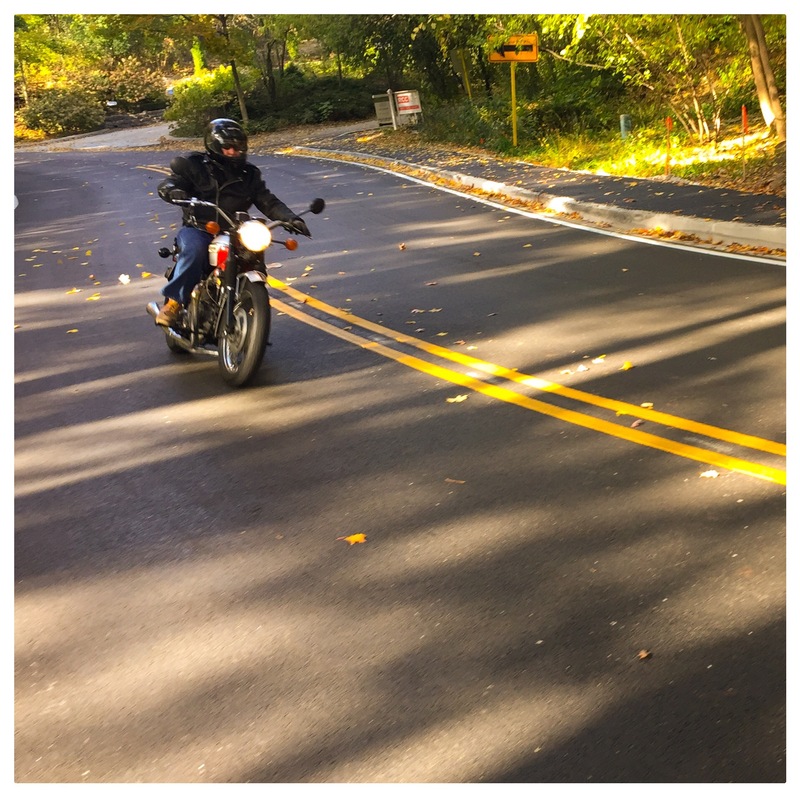 Fall Freewheeling- for a late October day and temperatures brushing 70 degrees; with a fiery foliage backdrop, and quiet roads: it was a perfect autumn ride. Bikes running well too. Tigress – the she-cat and her cub. 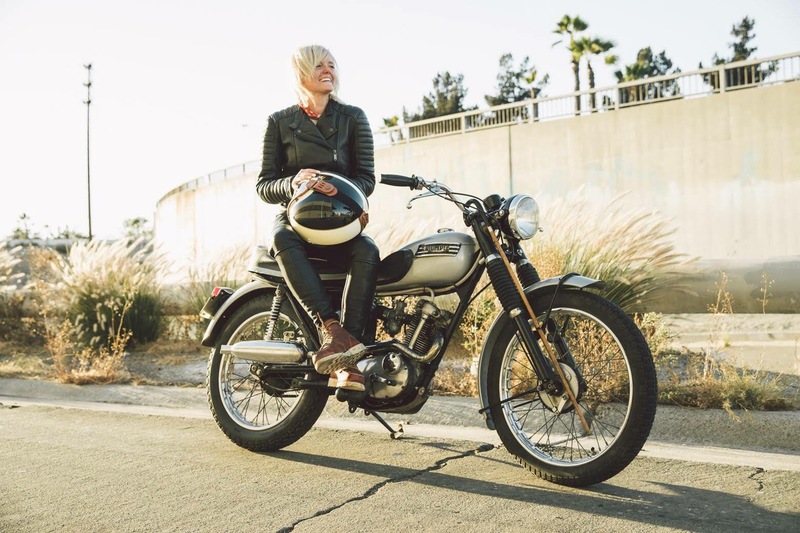 A happy rider is the proud owner of a clean looking Triumph Cub. 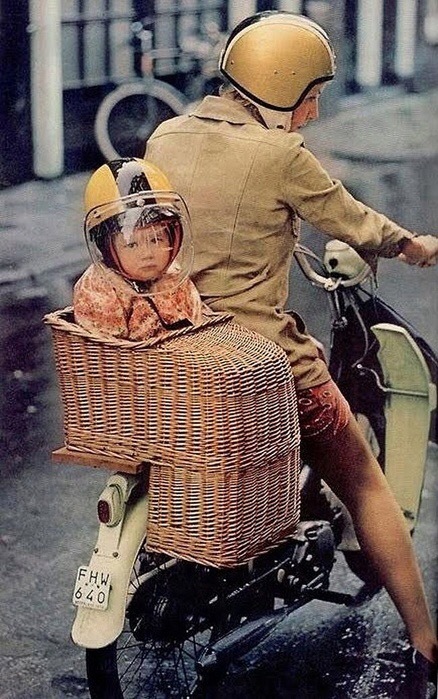 The Chaplin stick on the front forks is curious, but for a Baby Bonnie this one is full marks! 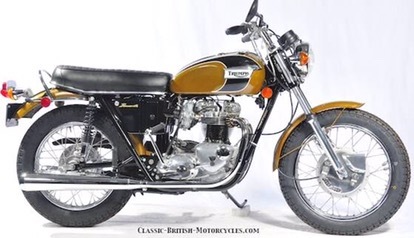 Oil in Frame – this is what my current Bonneville would have looked like rolling out of the factory. Mustard yellow, conical front drum brake, and a hefty oil filled backbone in the frame. Doesn’t look like that now! It’s a unique Geordies Bike! Vote Ch🙂pper – Extended Forks? Check! Ape Hangers? Check! 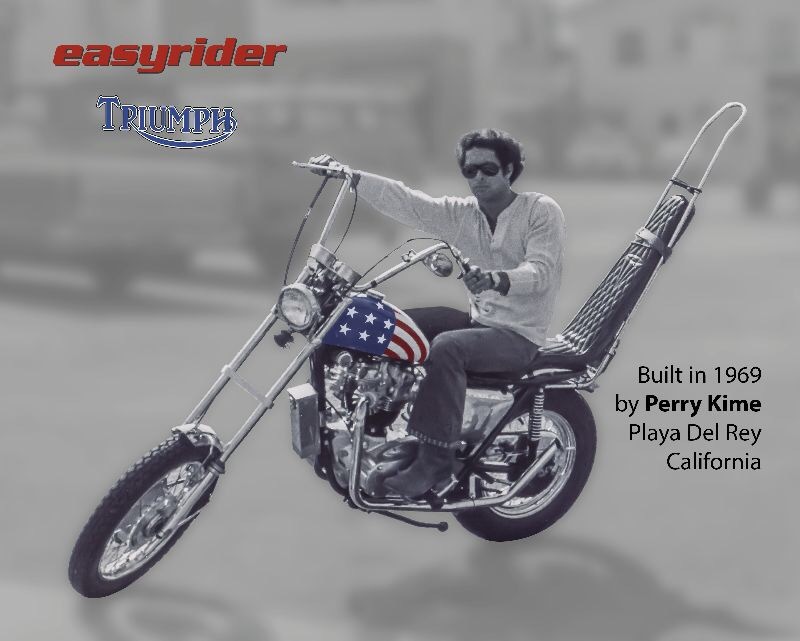 Sissy Bar? Check! Stars ‘n’ Stipes Peanut Gas Tank? Check! Cool Dude who looks like Warren Beaty? Check. We’re voting for a new president in a fortnight. It’ll be my first chance to have my day as such now being a US citizen. 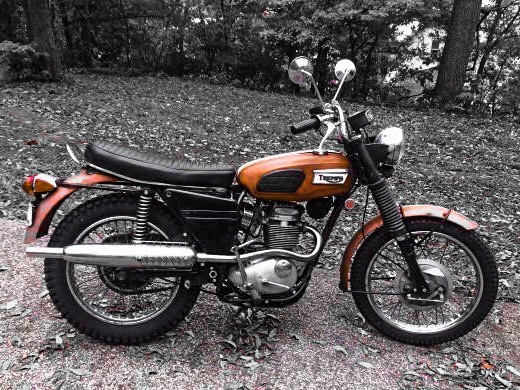 This British moto in American livery and style is what I’ll feel like at the voting booth. Verve- The aforementioned 90’s group frontman Richard Ashcroft has a freshly released album. One piece is supported by a cool video of this troubled troubadour alternately crooning and riding across a windswept British countryside. 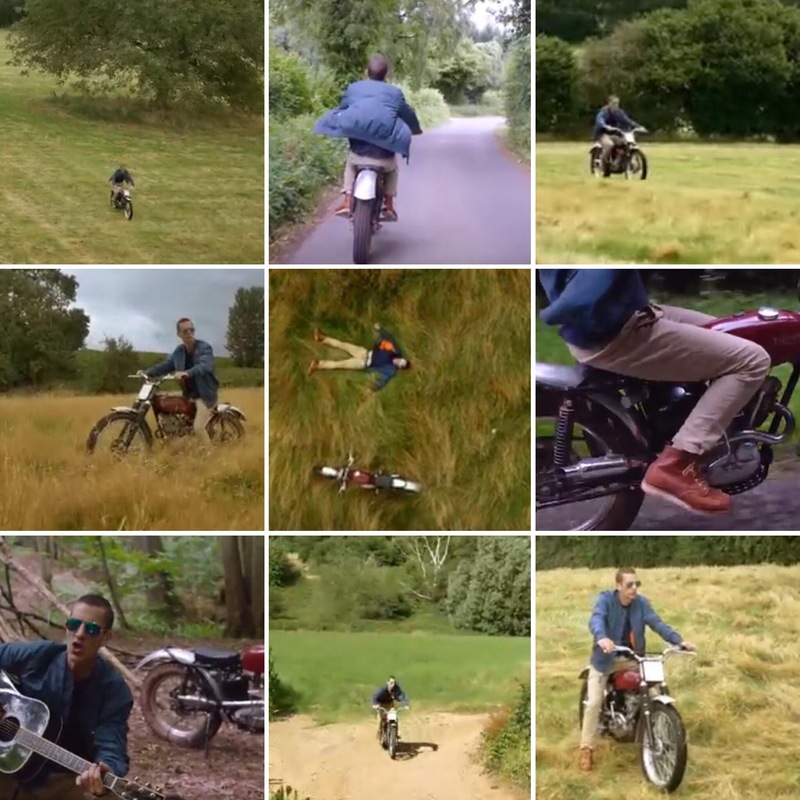 It’s a beautiful Triumph Cub in trials form that he scoots across meadow, through wood, and along lane on. Urban Hymns by The Verve is quintessential 90’s music. 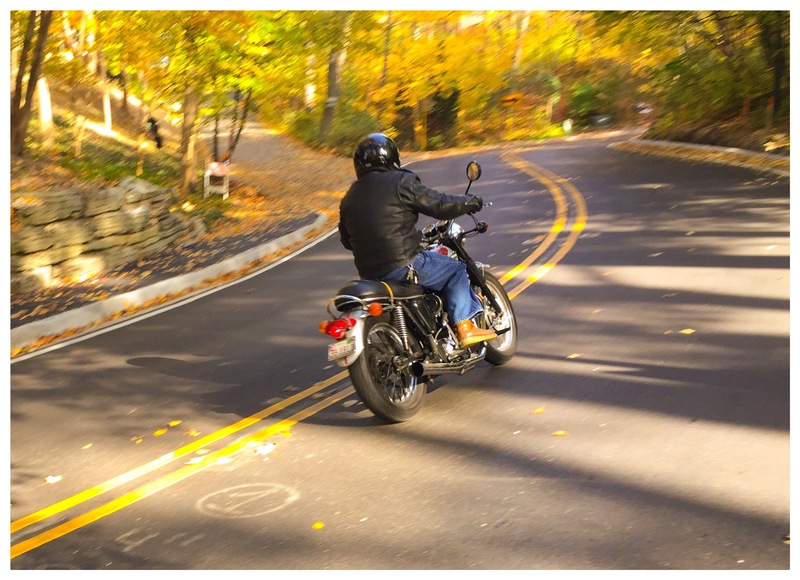 Autumn Curves- perfect Fall conditions on the roads today: crisp air with a warming sun. Oak, maple and elm bring a golden and fiery backdrop to the ride. 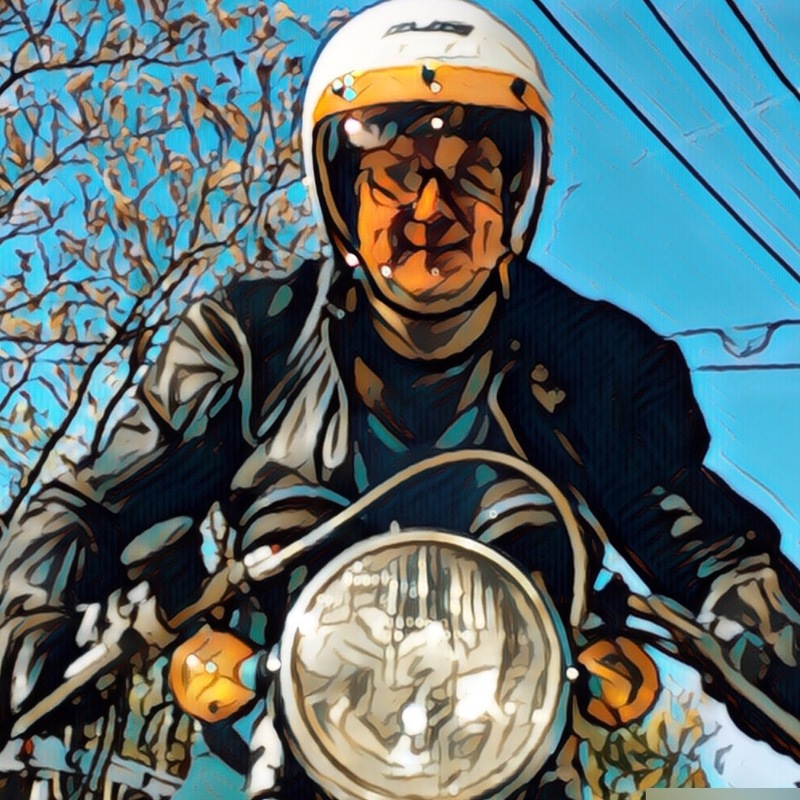 I wore an amber tinted visor; it was like riding in a Martian sunset, made things quite clear actually with a high definition monochrome- which didn’t affect the red and green traffic lights. 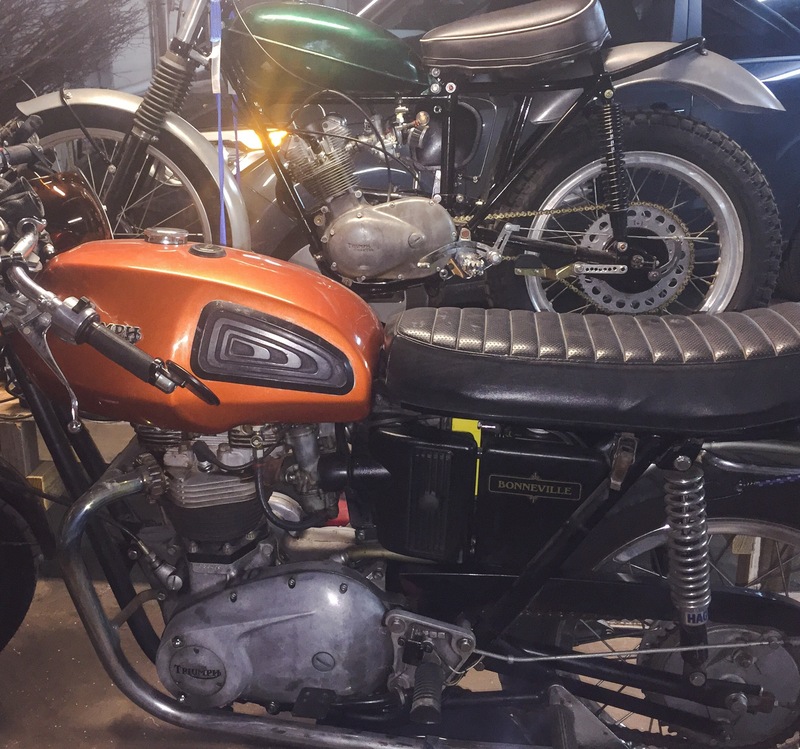 A Right Pair – here are the two bikes in drive side profile. A little tweaking of fuel lines. Had the Cub in tight figure eights around the garage. Tomorrow is forecast as perfect autumnal weather. The Bonnie will be taken out. On another note the Chicago Cubs just got through to the World Series. Flares – the early seventies sure were an interesting time for fashion: Platform boots and bell-bottom trousers. Package holidays at the Costa del Sol; Dad’s Army or On the Buses on the Telly. Decimalization in the wallet, Harvey Smiths V-sign to the Establishment. 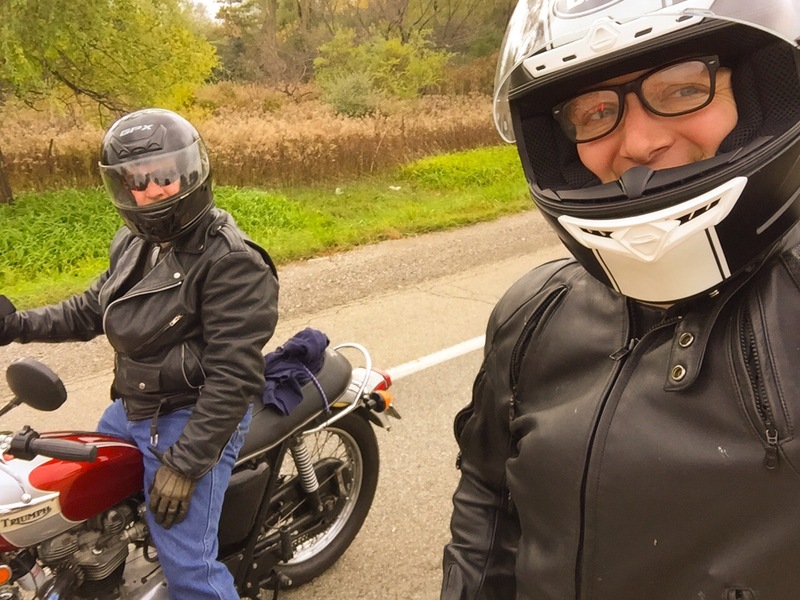 What better way to venture beyond the Age of Aquarius than on a sturdy Triumph? Basket Case – I’m going to sharpen my secateurs and coppice some willow to weave into a basket of wicker. Toting groceries, tools, parcels or small children. So hip it has a waist.